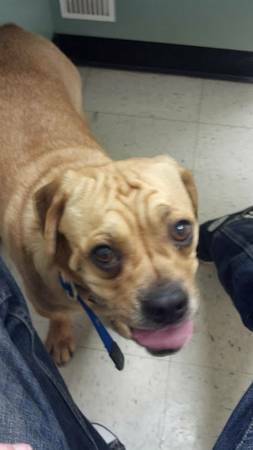 Toby my 30 lb reddish tan to beige puggle (beagle pug mix) is missing from my yard in Bissonet Plaza Subdivision in Metairie on Dec 12th. Toby has brown ears and eyes and is a small to medium sized dog. He was last seen on Blanke St and again on Tartan St. Please call Isabel 504 401-2932 or Jack 504 494-1754. REWARD if found and return to his loving family.